The Pyrates Royale To End Their Voyage? 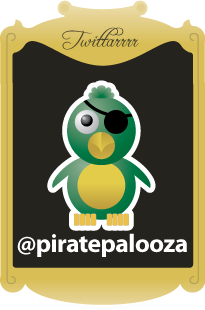 Posted by Captain Drew in Current Events, Minstrels, Pirate News. Comments Off on The Pyrates Royale To End Their Voyage? Shocking news reached the ship tonight that the Pyrates Royale have announced they would be ending the voyage they first began in 1986. Upon hearing the news Captain Drew issued the ship’s flags to be lowered to “one half thirds mast” and that extra rum rations be issued for himself until further notice. Curiosity abounds around the ship, but all agree that the Pyrates Royale were “not half bad” and that they were “an acceptable distraction from the pursuit of treasure and the pox, but not really the pox because that stuff is hard to forget”. For those of you just learning of this news we encourage you to keep an eye on the Pyrates Royale website for confirmation of the news that was first posted to Facebook on the evening of Friday, January 29, 2016. 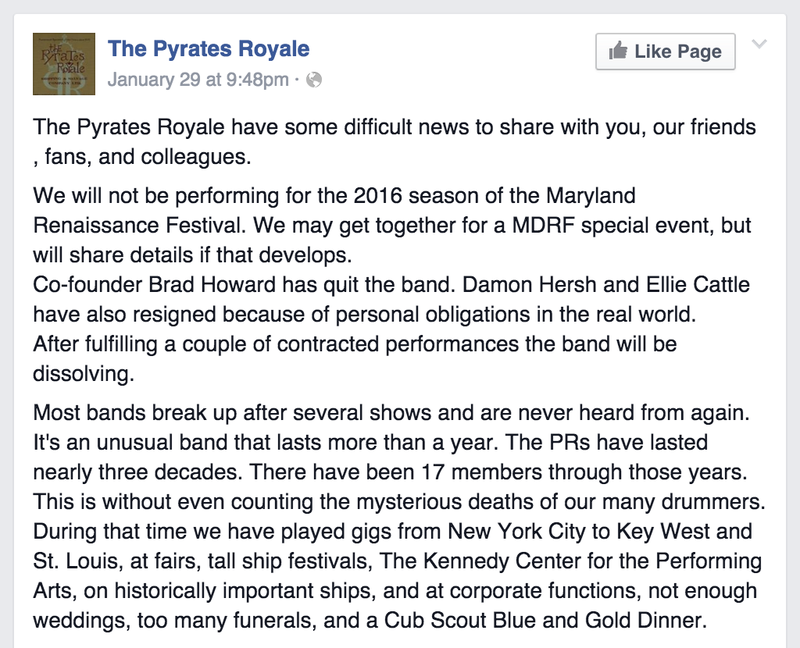 The Pyrates Royale have some difficult news to share with you, our friends , fans, and colleagues. 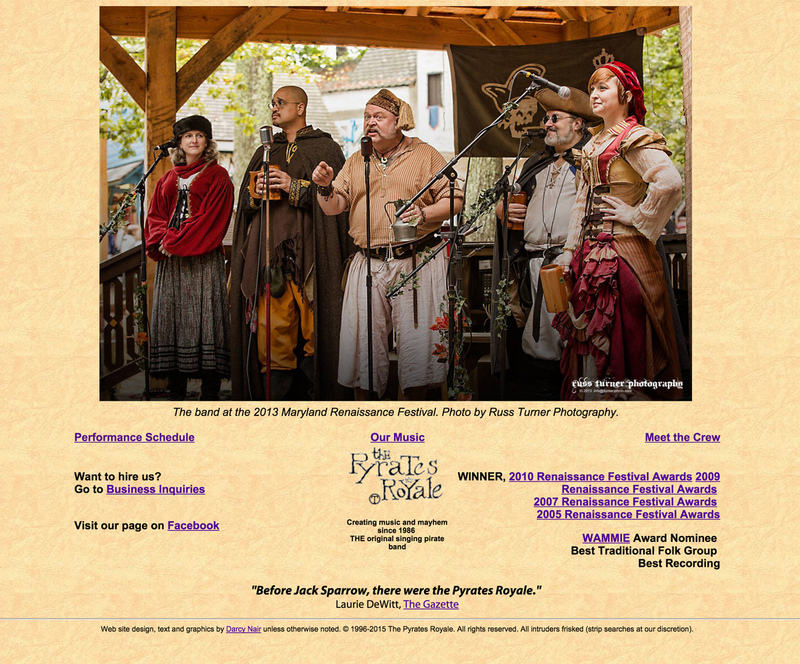 We will not be performing for the 2016 season of the Maryland Renaissance Festival. We may get together for a MDRF special event, but will share details if that develops. Co-founder Brad Howard has quit the band. Damon Hersh and Ellie Cattle have also resigned because of personal obligations in the real world. After fulfilling a couple of contracted performances the band will be dissolving. Most bands break up after several shows and are never heard from again. It’s an unusual band that lasts more than a year. The PRs have lasted nearly three decades. There have been 17 members through those years. This is without even counting the mysterious deaths of our many drummers. During that time we have played gigs from New York City to Key West and St. Louis, at fairs, tall ship festivals, The Kennedy Center for the Performing Arts, on historically important ships, and at corporate functions, not enough weddings, too many funerals, and a Cub Scout Blue and Gold Dinner. We’ve also been fortunate to have shared stages with wonderful musicians who have warmly welcomed us at every turn. To our friends, The Corsairs, The Ship’s Company Shantymen, The Crimson Pirates, Gypsophilia, The Brigands, Janie Meneely, Rich Follett, William Pint and Felicia Dale, The Boarding Party, the various talented musicians of the Carolina Renaissance Festival, Sterling Renaissance Festival, Georgia Renaissance Festival, Florida Renaissance Festival, Virginia Renaissance Faire, the Pennsylvania Renaissance Faire and to dozens of others we’ve met along the way, we thank you. But the most important performances for us have always been those at the Maryland Renaissance festival. MDRF is the best festival we’ve played; and we’ve been very fortunate to have done that. This fest was our birthplace and home. It would be difficult to overstate the level of support that the Smith family, and Carolyn Spedden, the cast and crew have given us over the years. We are so very grateful for their many kindnesses and concessions over the years. They continue to be our Renfaire heroes. Please don’t call or email the office staff to complain about our absence. We haven’t been fired. The PRs are walking into the sunset for our own reasons. We are also thankful to our various camp followers and CD sellers over the years- Michael Heaney, Brian Hemloche Lazar, Kim Workman, Shaun M. Bagley, Eric Dunn, Meredith Eriksen, Sam Cattle and our Camp Mom, Linda. They worked long hard days for us, and we appreciate their labors. Finally, we thank the hundreds and thousands of fans and friends we have met along our journey. Without your support and appreciation our band would not have lasted. We’ve come to know many of you personally. We don’t know if it showed, but there were many times that the simple act of being allowed to perform for you has gotten us through very difficult personal times. The deaths of our dear friends Bill Huttel and Paul DiBlasi and the events of 9/11 are only the most obvious examples. We valued your friendship and the various toys and baked goods you’ve shared with us. Darcy Nair and Craig Williams are working on building a new band. We’ll be doing a broader musical range of songs and tunes than in the past. At this time we are unsure if that new band will be playing at the MDRF this season. We’ll keep you informed as things develop. Thank you, thank you, thank you for all you have done for us. Captain Drew issued an official statement, saying “And how has it come that we are all made so worthy as to say that we did actually cross the same century with such legends? Remember then that each of us do truly live in an age of legends if we but seize this day and live out each hour like those Pyrates Royale of yore and…” – the Captain issued many more meritorious statements regarding the passing of the age of the Pyrates Royale but owing to an embarrassing set of geographic miscalculations the only people to hear him were a group of confounded Japanese tourists standing alongside a hotdog stand in Central Park.